Banded Garden Spider I can’t say positively this is a Banded Garden Spider since I didn’t see its top side. It’s web was huge! I found this spider on the side of the house when I went over there to turn the wagon around for #1 Grandson. The Spider was in the middle of its orb shaped web which spanned from one side of the fence to the house wall on the the other side; over 4 ft! The spider itself was about 2 inches long. Its head pointed down. #1 Grandson was fascinated with this spider so he kept going back to see it all afternoon. Later we tried to identify it, and learn about them. By the size and position of this spider I’d say it’s a female. I didn’t notice a male anywhere. That’s so wow!! Scary but wow!! we are getting close to scary movie season!! love it Deborah! Giant spiders fascinate me in a horrified sort of way. 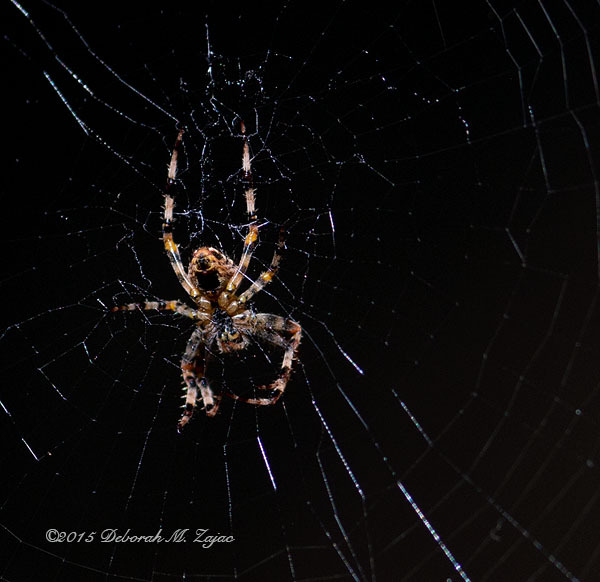 I have a big fat yellow one on a web on our sliding glass door. She is about the size of a 50 cent piece, with an enormous abdomen. Can’t keep my eyes off her. eek. Great photo – serious looking spider.